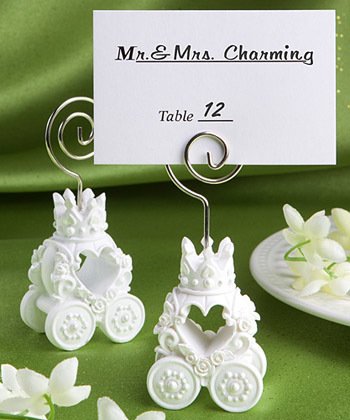 We are sure your guests will be charmed not only when they go to look for their seat assignments - also when they realize they can take home these lovely Cinderella Pumpkin Carriage place card holders to display a favorite photo or hold a memo. Each pumpkin coach card holder measures 3.25" x 1.25" and has a carved white poly resin base in the shape of an elegant, rose-enhanced coach with a heart shaped design and a dramatic crown top with rhinestone accents and a coiled silver metal wire holder at its top. These carriage design favors come bulk packed in a poly bag with blank place cards included.